Did you guess ricotta cheese? Or yogurt? Wrong. You’ll have to read on for the answer. What I will tell you is that the next iteration of this will be a chocolate peanut butter mousse. Throw it all in a blender and process until super creamy. Add extra honey to sweeten to taste. Chill and serve in small dishes. Top with whipped cream (I forgot to). I love this dish, it’s so easy and it tastes great. Depending on the brand of ricotta, the taste and texture can vary, so try several different ones until you find your favorite. It also tastes great without the peanut butter but I don’t recommend it =). Although every time I make it, I make it in two batches: one plain, one experimental. This peanut butter one was the latest experiment that went over well. By the way, this would make a wonderful pie filling. In fact, if you used a healthy pie crust like from my Triple Chocolate & Peanut Butter Pie, you’d have a mighty healthy and tasty pie on your hands. Nick – This is a wonderful recipe. I think this one will have a place in my hubby’s heart too. Looks great, I’ll have to try this one! I’ve had pumpkin mousse, but not peanut butter pumpkin mousee. I’ll have to try this! I’ve been loving the weather too. Walking around downtown Sacramento on my lunch break is way better than being cooped up in my office. thick coconut cream would work too, or non-hydrogenated tofutti cream cheese. ooh you know what I think? cashew ricotta from Veganomicon, only not the savory way it’s written! anyway, don’t mind me, but now that you’ve spoken of veganizing it, I’m day-dreaming about it. the other sub would be agave nectar or maple syrup for the honey, of course. it looks like a dream! and I be quiet now! please tell me you buy pb at wholesale prices! you must as much as you consume it! you need to find a sponsor! oh my god!!! that sounds amazing! pumpkin and pb thrown together in a mousse??? genius! Celine, I’d love to know if any of the veganizing works, let me know! I’m not experienced with that sorta stuff, but now is honey forbidden on vegan diet because a bee is needed to produce it? Bren, I wish I had a sponsor! I should write to PB&Co to sponsor me, that would be awesome. For now, I buy only Trader Joe’s brand which is my favorite and only costs $1.69 a jar. I don’t think you can get it cheaper even at Costco and certainly not natural. This looks interesting. I don’t think I’ve ever seen pumpkin mousse before. It would make a great dessert for people who don’t like chocolate, though. Can’t wait to try this!!! Looks like this is a great, health-conscious snack. Great recipe, healthy and yet strangely indulgent and suitable for those with and without teeth…. I like the idea of cashew ricotta from celine and coconut is a great partner for pumpkin with a bit of lime thrown in too. Hmm, might have to work on that one. Glad to hear your back is healing, just don’t over-do it in your enthusiasm to be back at the gym again. Have you thought about something like Iyengar yoga or pilates to help strengthen your back? If you do weights you could be overworking something, or aggravating it posturally? By the way – I’ve only just come down off that coffee! I think milk cuts the caffeine, so lattes are much milder. I’m just not ready for it yet….. SO glad that your back is feeling better – hope it continues to heal, quickly! Can you send a little of that warm weather our way? We’ve had a May Gray week with drizzle. Typical here for May. Peanutbutter pumpkin mousse? Wow that sounds crazy good! Yum! I am glad you are feeling better. Tell me – just how does one get addicted to the gym? I have been addicted to lots of things in my life but the gym was never one of them. You’re right, honey is not part of the typical vegan diet, but I know a lot of people have great success using agave nectar instead. I’ve even found it at my local TJ’s now but haven’t tried it yet. Nick, thanks on the advice on how to get addicted to the gym. You have inspired me. I think I will trade my cappucinno and sweets addictions for workouts! I am sure I will feel all the better for it! Recipe looks great. I’ll have to try it. BUT, more importantly………as a former “gym rat”, be VERY careful with your back! I’ve had to endure TWO major back operations, and one of them was the result of OVER DOING in the gym. So, ease off and slow it down. You are way to young to be experiencing these problems, so put the brakes on now to avoid any further complications. Believe me, you will be thankful you did. I only wish my trainers and I knew that the old mantra” No pain, No gain” WAS NOT the appropriate way to gain weight and muscle mass. Oooooh – the magic words, pumpkin and peanut butter! YUM!!!! I bet mascarpone would work nicely in this too. I’m so sorry about your back. Have you tried acupuncture? My husband had a bad back problem recently and it made him feel much better (he’s sleeping better too!). Hope you’re back to 100% very soon! This recipe looks great! It is still pretty cold here in NJ but the minute the temp rises I will be making this! Thanks for it! 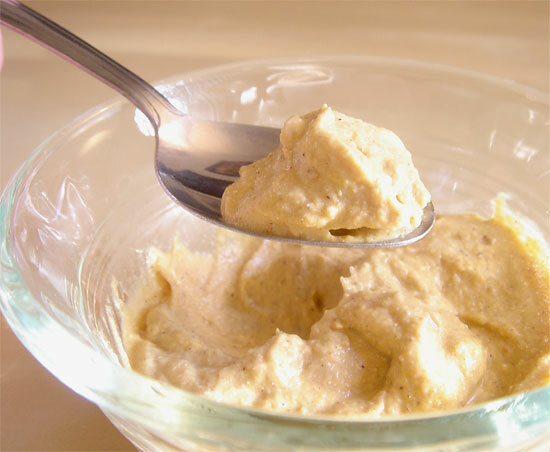 Interesting recipe and I have to say I have never thought of using peanut butter in mousse. Looks creamy as well. Hey Nick. I feel your back pain. I agree about not overdoing. I’ve had spine surgery as a kid and now wrestle with intense back pain that comes and goes. May I suggest a stationary bike/light activity. Water exercise is low impact/stress so maybe that could help. That shouldn’t stress your back. I also do some gentle stretching/program physical therapist developed for me to strengthen my back muscles. You don’t want to do more damage that will impair your future lifestyle. Your recipes are marvelous! Keep ’em coming. Ooh, thank you thank you! This looks sooo delish. How’s the back? I agree that you should skip the gym and try the pool instead. Recipegirl, Precisely! No gym = decadent desserts. I’m pretty sure I learned that in Calc II. I can certainly share some warm weather, the next 10 days all look between 90 and 100 degrees…now THAT’s toasty! anniem, Haha, it’s really not that strange, I hope you’ll try it! Carol, Trade the sweets, but keep the cappuccino and put that energy towards the gym! After I have my morning Cafe Au Lait, I feel like doing jumping jacks, but I usually wait to do those in public at bus stops. Mark Boxshus, That sounds really intense, I will take it easy. I’m certainly not doing anything the involves the back for many months. Even when I do, I think I’ll only do upper back that corresponds to some bicep workouts. By the way, I think we need to start our own country for tall people. Maybe we should contact the people at the “Big & Tall store”, see if they have any suggestions. CookiePie, I thought about acupuncture and I believe they actually offer it at my school. I’ll have to ask my physical therapist about it and see what he thinks. daphne, Thanks! I’m working on getting a bit better every day. And yes it is very creamy, make sure to get a really good ricotta. erika, Done and done. Your recipe is now online =). Anonymous, I’ve tried various exercises: running is probably the worse and I recently had the elliptical bother my back as well. I’ve tried the bike but I think it was bothering it too, which explains why I can’t bike to school and have to take the bus which is really frustrating me. There is an outdoor pool at my complex, I’ll have to start doing some of that. I hope your back improves too! Dee, The back is better, but I still feel it. It feels like a bulge in the lower right of my back. I just want it to go away!! But enjoy the mousse! This recipe looks awesome, and with the protein content from the cheese and pb, and fiber from the pumpkin, this is a damn healthy treat. I’ve made something similar to this with cottage cheese, so I can’t wait to try this with the ricotta. I love that you used cheese instead of cream. Yum–and fascinating. Plus pumpkin’s a superfood. :) At least in my opinion. hey Nick!! love the peanut butter recipes! keep up the good work! WOW – this sounds fabulous! 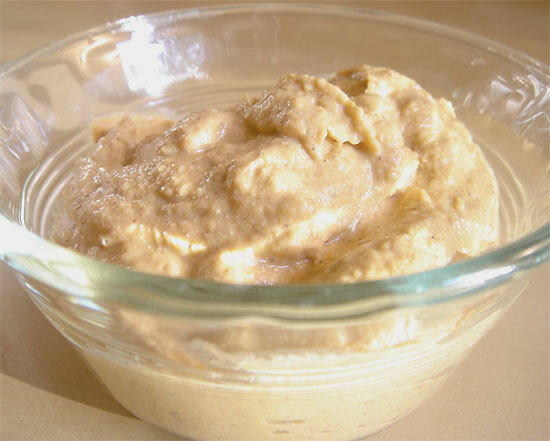 Peanut butter and ricotta – a match made in heaven! Hmm, good idea Bev, I bet you could. I use cottage cheese in my banana pancakes and it actually works better than ricotta. Pureed cottage cheese might be a little bit runnier than ricotta but I bet it’ll be delicious! Let me know if you try it. yummy, this must’ve tasted heavenly! I’d like to invite you to send this in for my vegetarian thanksgiving recipe event Nick, as it would be ideal for T-day dinner! Thank goodness peanut butter is low carb. :) Will have to try this scrumptious-looking pudding. Fabulous blog! Hi! I just made (and ate) Pumpkin PB Mousse! I blogged about it here http://surfnrunnr.tumblr.com/post/12274709417/a-serving-of-vegetables-for-dessert-what if you are interested in seeing some responses. Now get to work on that chocolate/pb one. ;) I’ve seen many use avocado a lot to make chocolate mousse. I agree – it doesn’t sound super enticing. The tartness of greek yogurt definitely affects the flavor, whereas the cottage cheese is extremely mild (and you puree the chunks out, so it won’t be “chunky”). I threw protein powder in one time too! It works great! Give it a shot with the cottage cheese, you’ll like it!